Commitment to recycling can now also generate points that will give discounts on the purchase of products. 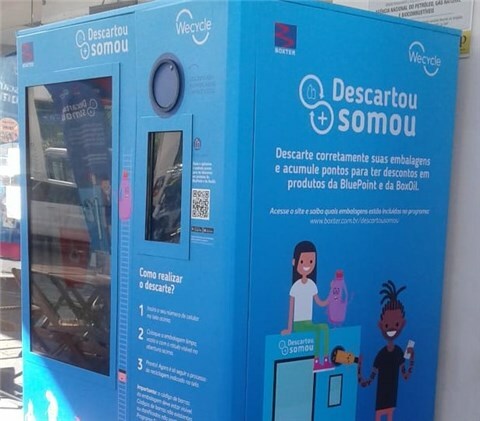 This is the idea of the “Descartou, Somou!” (Discard and Add up) Program, a pilot project carried out by Braskem in partnership with the Boxes Station Network, which, starting in April, will house a collection point for recyclable packaging with a machine that punctuates consumers with every discard. The action to encourage conscious disposal is yet another Wecycle initiative of Braskem, together with the companies Recycleol (developer of the recycling machine), Dinâmica Ambiental(responsible for reverse logistics) and Zaraplast (packaging manufacturer) support. After the inauguration of the collection point, consumers will be able to take the empty, clean packs, with visible barcodes, to the participating station located at Avenida Álvaro Ramos, 707, near Radial Leste, in São Paulo. There, it will be possible to properly dispose of the material in a recycling machine and accumulate points for discounts on products. To participate in the initiative, just download the application from Recicletool, available for free to Android smartphones and soon to IOS, or through the website www.boxter.com.br/DescartouSomou and register your cell phone number. The score to be accumulated will vary according to the type of packaging deposited (see the list available at the website). The points will be converted into discounts on products that can be exchanged at BluePoint - Boxter’s station convenience store - or at the participant gas station’s BoxOil. To close the cycle, all packs that are disposed of correctly in the machine will be removed from the station by the company Dinâmica Ambiental, which will take the waste to cooperatives, where it will be separated and sent for recycling. In the future, separated plastic waste will become the raw material for the production of PCR (post-consumer resin) by Braskem and, thus, will be able to be transformed into packaging again. The initiative, still implemented in a pilot phase, is based on the concept of Circular Economy, a position reported by Braskem at the end of 2018, a production process that includes the reduction, reuse, recovery and recycling of materials, forming a sustainable cycle from the reinsertion into a new production process. “An interesting feature of this project is the interaction and engagement of consumers in the correct destination and recycling of materials. It is a way of contributing towards environmental education, encouraging everyone to feel responsible and to be aware of the final destination of what they consume and with the disposal of these materials,” comments Fabiana Quiroga, the person in charge of Braskem’s Recycling & Wecycle Platform. “Being a network of gas stations with a high flow of people every day, we believe that our participation in this project is very important for the awareness of consumers about the disposal and recycling of materials. Boxter is a pioneer in the segment by encouraging the correct disposal and rewarding consumers for it,” says Renan Cepeda Gonçalves, Managing Partner of Boxter. In November 2018, Braskem defined a series of global initiatives to boost the Circular Economy in the plastic chain. Entitled “Braskem’s Positioning in Circular Economy.” The document establishes initiatives for the development of partnerships with customers in the design of new products to expand and facilitate the recycling and reuse of plastic packaging, especially those for single use. It also includes investments in new renewable resins, such as Green Plastic made from sugarcane, and support for new technologies, business models and collection, sorting, recycling and recovery of materials. The actions also include the promotion of consumer engagement in recycling programs through conscientious consumption educational actions, use of life-cycle assessment tools, and support for actions to improve solid waste management, in order to prevent garbage disposal in the seas. To learn more about “Braskem Positioning in Circular Economy”, visit www.braskem.com/circulareconomy . Boxter started its activities in the year 2013 with the objective of marketing a suitable flag, which ensures the quality of the services provided. It started a pioneering work in the automotive segment, in order to meet and expand the expectations of customers and employees regarding the quality of the products and services marketed, after-sales assistance, punctuality and responsibility. With more than 80 units, the company prioritizes the relationship with customers, the continuous search for optimizing services and the mix of products marketed, in addition to an entrepreneurial vision, promoting growth and success at Boxter. Zaraplast is a leader in flexible packaging solutions, providing a wide range of products to the food, beverage, health, hygiene and cleaning, agribusiness, animal nutrition, building materials, chemicals and petrochemicals and fertilizers markets. With more than 10 units, located in Brazil, Zaraplast exports to countries in North and Latin America, Europe and Asia-Pacific. Motivated by the process of continuous improvement and focus on sustainable development, Zaraplast’s principle is to constantly invest in management systems and in its processes, with the aim of ensuring the preservation of the environment by reducing the environmental impacts associated with its activities. Dynamics is a Frag Group company focused on the environmental area, standing out as the largest installed capacity in aerosol processing in Brazil. It acts in the areas of reverse engineering, waste management, information management, logistics, marketing and other solutions. The Frag Group has been operating for more than 45 years, developing results and technologies to more than 26 thousand clients in Brazil and abroad. ISO 9001 - ISO 14001 - ISO 37001 - OHSAS 18001 and B Corporation Integrated System. Recycletool is a company focused on providing solutions for reverse logistics and solid waste management by manufacturing packaging collection and identification equipment that encourage people to recycle through the delivery of benefits. It was one of the participants in the Braskem Labs program for accelerating startups.